Bringing students to professional learning conferences has benefits for both the students and educators. The audience settled in for a highly anticipated session at the Middle Grades Collaborative conference, a statewide education conference in Vermont. Jen Hill, a superstar librarian and change agent, started by noting that the session would focus on the ways in which student voice had shaped key school policies related to personalized learning. And then she turned the presentation over to students. The students offered their perspective on what was going well with personalized learning and what needed to change in the future. They described their leadership activities in great detail by referencing the continuum of student voice as a framework for the evolution of their work. During the Q&A, they gave candid advice that was immediately applicable for audience members. The session was heartfelt, persuasive, insightful, and practical. What more could an educator ask for? Student presenters are becoming increasingly common at education conferences in Vermont. At the Dynamic Landscapes conference in May, for example, there were over 100 students presenting or participating to enhance the professional learning of educators. This is a substantial student presence for a two-day conference averaging 350 attendees per day. While it’s especially important to put students front and center at events that are meant to promote and support student-centered learning, I would argue that the student perspective will enhance almost any type of professional learning by educators. Vermont students head out to present their work and ideas at a conference. 2. 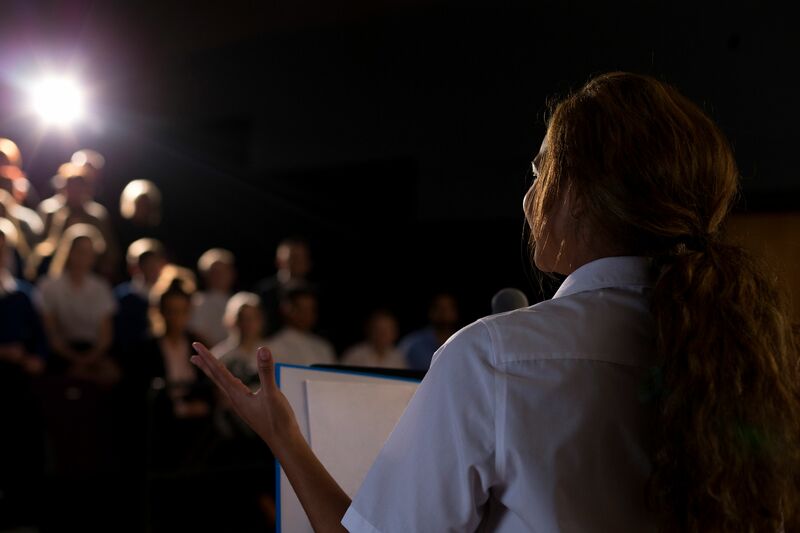 Your students will present to an authentic audience: Students get to provide their perspective—and potentially share their work, depending on your topic—to interested educators, underscoring the purpose of school in general and the practices that you are presenting in particular. Whether students present projects they’ve created or share ideas as student leaders, conferences are a great venue for a culminating event. 4. Your students will learn: Students will have the chance to delve into the rationale and design of your teaching practice. They’ll engage in metacognition as they reflect on their experiences and gain a better understanding of learning and of themselves as learners. If they present about a specific project, they will solidify their learning. 5. You will be inspired: Your students will step up and amaze you with their thoughtfulness and performance, and they’ll appreciate your trust in them. Your willingness to take a chance on them and provide a public platform for student leadership and feedback may remind you of the transformative power you have as an educator. And bringing students to conferences can change the conversation back at your school, too. Vermont’s Crossett Brook Middle School took an entire busload of students to present in several sessions. Fifteen percent of the students, along with their principal and several teachers, were out of the building for a day to share their leadership activities and lessons learned in several sessions. This kind of critical mass reflects and reinforces a student-centered culture. If doing this seems daunting, consider shifting your school culture in this direction by looking for ongoing opportunities for students to present to authentic audiences. For example, at another Vermont school, Colchester Middle School, every faculty meeting starts with a student presentation of some sort. This shift can also start at the classroom level, with project-based learning units that involve authentic audiences at various stages and during culminating events. Whether you jump right in or build up to doing this, be assured that copresenting with students has huge benefits for them and for professional learning.